My hubster and I LOVE pan mee. We each have our favourite spots for pan mee but we both agree on the same place when it comes to the dry chilli pan mee. 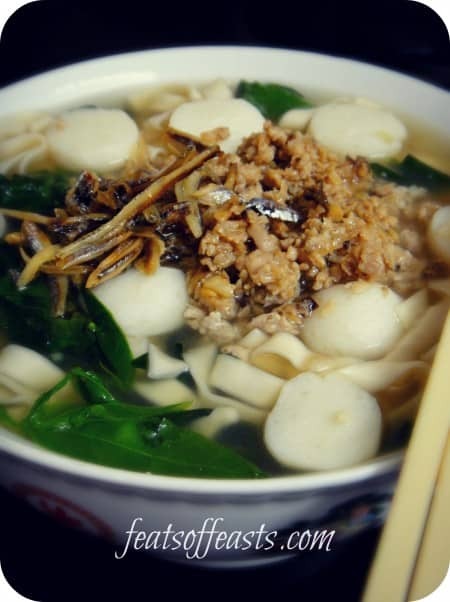 I have always thought of making this at home but I do not know the first thing about making pan mee. The important thing I feel that makes a good pan mee is #1; the broth, #2; the noodles and #3; the chilli dipping sauce. Since this was my first time making pan mee, I thought I don’t stress myself out first by aiming to do everything from scratch but rather to get the taste right in the initial process. That meaning I used stock cubes for the broth (in case I mess up then I don’t feel like my chicken stock is wasted) and dried pan mee noodles. 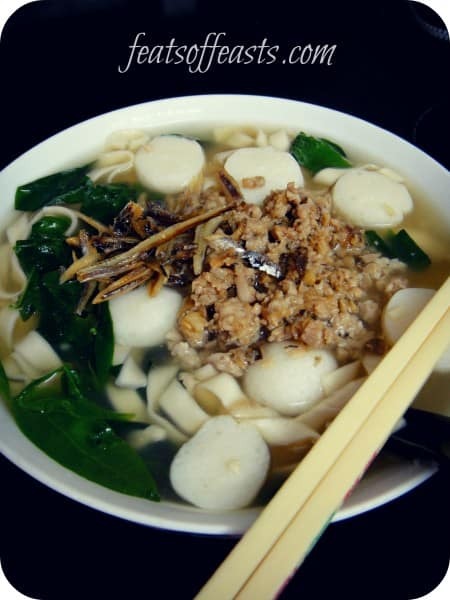 But the essential vegetable for this dish is pucuk manis, sweet leaf or ‘manichai’ is Chinese. They’re really cheap, even cheaper if you grow them yourself because they’re require very low maintenance. What is pucuk manis? Find out here. Hubster loved it, little J-man loved it too and I…well, you are your own harshest critic. I thought it was good but I didn’t have time to come up with a good chilli dipping sauce so I thought that lacked something. But this is rather preferential because I think pan mee’s chilli is different from other normal chilli dipping sauce. Still it was a good attempt at making a hawker stall fare. So if I crave for it, I’d know how to make it home since eating out now, even at hawker stalls, can be rather pricey. 1. Marinade the minced pork with; minced shitake, minced garlic, rice wine, MSG, salt, white pepper and sesame oil. Let it sit there while you prepare the broth. 2. In a heavy based pot, sautee the garlic and anchovies/ ikan bilis in a little sunflower oil. When they start to colour, pour in the water. 3. Add the stock cubes, white pepper and light soy sauce. Let it come to a boil. As soon as it has boiled, add your 2 big bunches of pucuk manis, stir and close the lid. Turn off the heat. Let it sit there while you cook the minced pork. 4. In a wok, add some sunflower oil and sautee the sliced shallots. When it starts to colour add the minced pork mix and stir-fry with some light soy sauce, oyster sauce and dark soy sauce. Taste and adjust. Add a little water if it’s too dry. 5. Lightly fry some anchovies as till it’s crisp. 6. 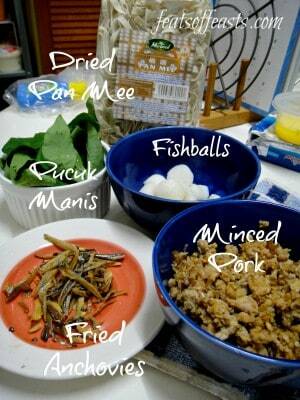 Gather your pan mee assembly ingredients together (below). I forgot to include the sliced shitakes in the picture…..
7. 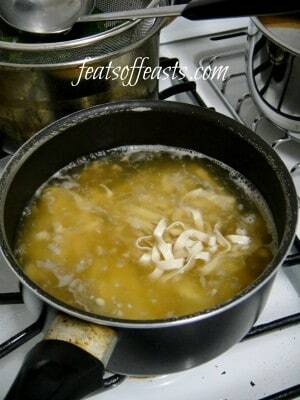 In a separate pot, put a strainer on top and pour some broth in it to boil. Add a bit of the minced pork to the soup first. 8. Add your dried pan mee noodles and let it boil for about 1-2 mins. 9. Add fishballs, pucuk manis and sliced shitakes (which I forgot in the picture too). 10. Turn off heat, dish it out into a bowl. Top with more minced pork and fried anchovies/ ikan bilis. Eat with some chilli dipping sauce.